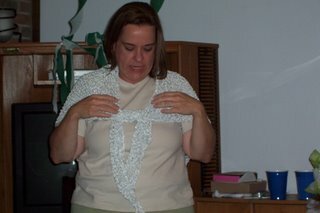 I gave away the bridal shawl without a good picture of it alone. Here is my sister, trying it on. 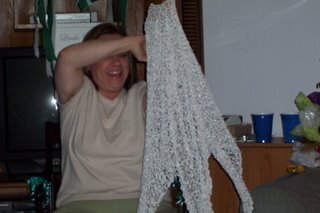 It is knit with Louisa Harding Glisten color #1, the white with silver through it. it's a ribbon yarn, but the metallic silver bits kept snagging on every little thing (like my rough callouses, even). I knit it on size 15 circulars. it was boring, but it looks pretty and at least now it's done! I think she likes it, but no idea if she'll wear it for the wedding or not. Ah well. Such is life - full of mysteries. Your shawl turned out to be so pretty!!! I saw it when you first started it and I knew it was going to be beautiful... you did a great job. It was so thoughtful of you to make it for her. Hope she gets a chance to wear it on her 'big day'.